Are you interested what this vehicle means? It´s name is Quike and it is machine which is supposed to start in April a long long journey in Central Asia. The rider will be australian couple Roger and Megan. They plan to cross 7 countries during their 12.000 km long expedition which will take about 12 months. Especialy Roger is experienced adventurer. He crossed the Greenland Icecap unsupported as the youngest person ever in 2007. The Quike is a bike (???) specialy designed and build only for this expedition. 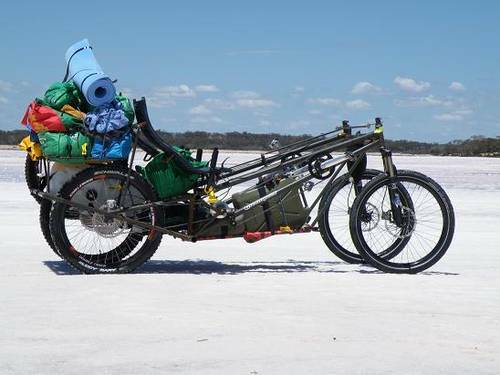 They expect to spend long time in areas with low civilization so the bike is able to carry loads up to 200 kg. It has four big wheels to be able to cross terrains which are not suitable for ordinary bikes or cars. The machine was built in cooperation with Paul Sims from Greenspeed and right now it is equiped by two Rohloff hubs, FOX suspensioned forks and hydraulic brakes.